“First of all – what an amazing book! It will, without doubt, change lives. I am in the very lucky position that this book is not 101% relevant to me. Recently, after I found gainful employ, I was lucky enough to have my lovely wife ask me why I left the house at 7 am and returned after 7pm – never seeing my 2 yr old son. I didn’t have an answer. About that time I received your book in the mail. Due to ‘Life Matches’ I have been able to shorten my hours at work, but increase my productivity. Your method of choosing to do what we are best at (for good or for bad) has meant that I have taken over a managerial role, with more human interface, as well as creating more statistics for the bosses, but with less time in the office. Everyone wins with Life Matches! My bosses are happy as the work gets done, on time, and with interesting insights and a very positive attitude. My wife and son are happy as they get to see me more and I can help out around the house. And I am happy; because my life is… better! 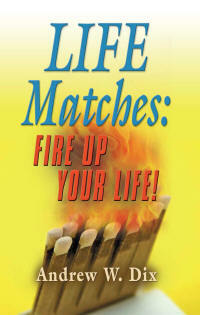 “Just wanted to say that I really enjoyed LIFE Matches: Fire up your life! It is very timely for my life as Natalie heads to IU in the fall and for the first time in 25 1/2 years I will not have kids at home with me. I plan to take a year to reflect and evaluate my life and your book has given me some more concepts to consider. I’m sure that everyone else who reads this book will be touched as well. Thanks again for sharing YOUR gifts and talents! I read your book today. Really enjoyed the story of Tim and his learning about strengths. I will pass the book along today to Jim Elrod, our new associate pastor. He has been trained as a “Strengths Coach” through the Clifton Strength-finder organization. He uses his coaching often in ministry here at Clay to help people with their “next steps” with God and ministry. My wife brought your book home and I had the chance to read it. I enjoyed the story. I have been thinking about how to raise my teams level and get them to think about relationships, trust and results just name a few…. With that said, I understand the story and the message. This is something I’ve believed in for a long time. Thanks again for sharing your book and I look forward to seeing you in the future. Good luck with the book and I wish you you all the success!!!! “Fired Up!!! Andy your book is fantastic. Love the fact that it truly makes you look within your inner soul. It really helps with complacency, safety, pushes the envelope. This books really concentrates on the gospel; living the Lord with all your mind, heart and spirit, for this book resonates this to me. For doing all that is fired up and all that fizzles out (weakness) is putting all your trust in the Lord and accepting what He has in store for us. I could go on and on, but you are the author and already know all of this. Thanks for sharing your gift with me and others. Hope is well with you and yours!